Screen shot of the Brightpearl / Zendesk integration, showing contact and order information in Zendesk. See Brightpearl contacts and orders in Zendesk, and Zendesk tickets in Brightpearl. Contact and order information shown in Zendesk, so you can see more about the person you're dealing with. Do they have any open orders? Has it been shipped? What's the tracking reference? Open tickets for a contact are shown within Brightpearl screens, so your team can see the latest customer service issues right when they need them. See Brightpearl contacts and orders in Front. Contact and order information shown in Front, so you can see more about the person you're dealing with. Do they have any open orders? The right hand side of your Front screen shows Brightpearl information. 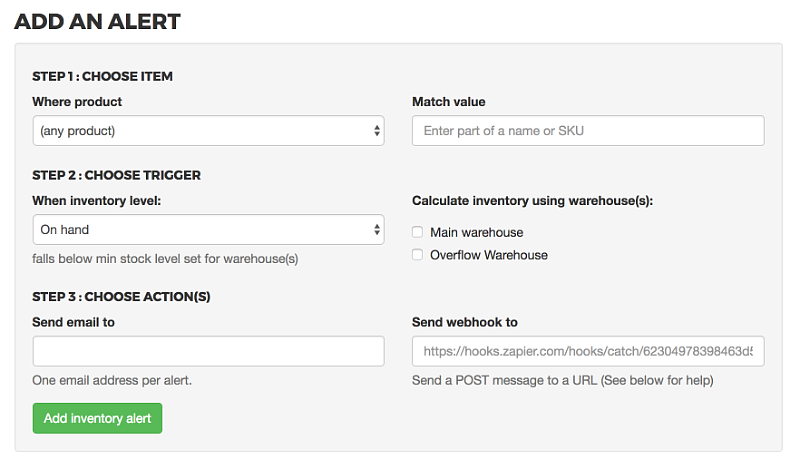 Get email or webhook updates when inventory gets low. We receive alerts from Brightpearl* whenever an item's stock level changes, we compare it to minimum stock levels for that item in selected warehouses, and then let you know when you're running low. * Brightpearl webhooks are not a 100% guaranteed service, but in our experience they are very reliable. Making Brightpearl even more powerful. © 2017 Annex Apps. All Rights Reserved.